IBackup is a utilitarian cloud backup service aimed at small businesses with top-notch security and a suite of useful add-ons. IBackup is a cloud backup service primarily aimed at small businesses. It’s not pretty and not exactly what you’d call feature-rich, but what it lacks in bells and whistles it makes up for in security, storage space, and enterprise-level functionality. IBackup offers five tiers with monthly, annual, and biannual pricing. The basic service nets you 10GB of space for $9.95 (GBP 6.40) per month, $99.50 (GBP 63.96) per year, or $149.25 (GBP 99.95) per two years. From there, you can upgrade to 20GB, 50GB, 100GB, or 200GB for up to $199.95 per month. During the time of writing, IBackup offers a promotional price wherein customers can get 50 times as much space for the same price at each tier. That’s 500GB at the lowest tier and 10TB at the highest. If you’re considering subscribing to IBackup, it might be worth waiting for this sort of promotion to roll around again, though the company doesn’t disclose when those promotions happen or if they will happen again at all. Alternatively, you could subscribe to one of IBackup’s cheaper plans and upgrade when if/when another promotion takes place, as upgrading qualifies you for the promotional price. A free 15-day trial with 50GB of space is also available, but it requires credit card info, so be sure to cancel if you decide not to continue the service. On the whole, IBackup is a bit more expensive than average, but it’s not exorbitant by any means. Trouble comes when you run over your allocated storage. IBackup charges $2 (GBP 1.29) per 1GB per month for overuse. So what makes IBackup so good for small businesses? One major advantage is the ability to create sub accounts for employees to backup their hard drives. A sub-account is similar to a regular IBackup account, which you can create for your associates, business departments, or personal contacts using your account space. A sub-account can backup unlimited PCs, Macs and smart phones (so long as you stay within your storage limit, of course). The administrator for each sub-account can allocate space, monitor activities, and view backup reports from a centralized dashboard. The first 10 sub-accounts are free, and they cost $20 (GBP 12.86) each per year after that. IBackup offers a suite of other services tailored for more specific needs. Server backups allow you to backup MySQL, Exchange Brick Level, Oracle, Hyper-V, MS Exchange, and MS SharePoint servers, as well as system state backups of critical system-related components. DataCenter edition is a browser-based backup solution for remote and local Linux servers. IBackup supports hybrid backups so you can simultaneously back up data to both the cloud and a local drive, internal or external. If a restoration is required but would take too much time or is otherwise not feasible to download from the cloud, IBackup will mail you a physical storage device within seven days via its IBackup Express service. IBackup stores the last 10 versions of all modified files in the default backup. As a bonus, you can even restore the last 10 versions of entire folders in addition to individual files. The rest of IBackup’s features are fairly standard. Smaller files (up to 500MB) can be backed up continuously, but larger files are uploaded in the normally scheduled backups. Those backups can be set up to occur on an hourly or daily basis. 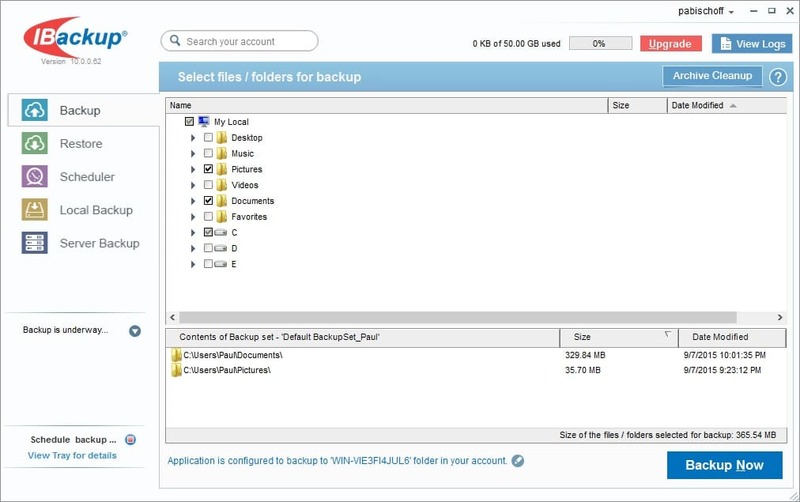 To save space on your cloud, IBackup can perform “archive cleanups” that delete any files from a backup no longer located on the original computer. This makes a one-to-one match of the local data to what’s in the backup. You can configure what percentage of files to consider for the cleanup and schedule them periodically. Certain types of files get compressed by default during upload, speeding up backup speed and saving space in the cloud. Incremental backup saves bandwidth by checking the timestamp of all files in your selected folders and only updating parts of files that have been modified, rather than backing up entire files again. A few other articles on the web mention IBackup supporting email dropping, wherein the user sends an email with an attachment, and that attachment is automatically uploaded to his or her cloud. After a bit of digging, I actually found an FAQ from IBackup explaining how it works, but it seems the feature is no longer supported (more on this little debacle in the Customer Service section). IBackup’s privacy and security features are the best you could reasonably ask for and are well-suited to enterprise customers. All transfers are encrypted through SSL, the same standard of security used by financial institutions and major ecommerce sites (any time you use an HTTPS website, it’s probably protected with SSL). Once your data is on the cloud, it’s 256-bit AES encrypted, which is as good as it gets for backup. IBackup gives you two options: use the company’s encryption key or create your own. The former is more convenient; you don’t need to store or memorize anything. However, you’ll be using the same encryption key as everyone else who chooses this option. If IBackup gets hacked, everyone is vulnerable. The second and more secure option is to use your own encryption key. This puts you in control of your own security. Not even IBackup itself can decrypt your files because it does not store the private encryption key on its servers. Be cautious, however. Once a private key is set, it can never be changed. If you lose it, your backups are lost to you forever. If someone steals it, IBackup is not responsible. Finally, IBackup’s California-based parent company, Pro Softnet Corporation, owns its own physical servers. It doesn’t rent virtual or physical ones from providers like Amazon or Rackspace. That adds a layer of privacy and security, not to mention knowledge of where your data is stored. Pro Softnet claims to operate 30 pedabytes of server space. It also guarantees geo-redundant storage, which means copies of your data are stored and secured in multiple physical locations. IBackup’s interface across all platforms – browser, mobile app, and desktop client – is clean, no-nonsense, and utilitarian. It’s not going to win any design awards, but it gets the job done. The service offers apps on Windows, Mac, Linux, iOS, Android, and the web. The desktop client is outfitted with five tabs: backup, restore, scheduler, local backup, and server backup. A file browser lets you mark files and folders for backup or recovery at the top, while the bottom provides metadata and version info on whatever is selected. A search bar at the top lets you quickly find the files you’re looking for but can only search by file name and metadata, not file contents. Icons are either files or folders, with no other graphical indication as to what they might contain. There are no thumbnails for photos and videos or previews for text documents. Once installed on a desktop, popups from the notification area pestering the user to upgrade occur a bit too frequently. Emails alerting the user to successfully completed backups can also get irritating but can thankfully be switched off. The mobile app is similarly bare bones. The opening screen presents the user with four options: backup, access and restore, shortcuts, and settings. 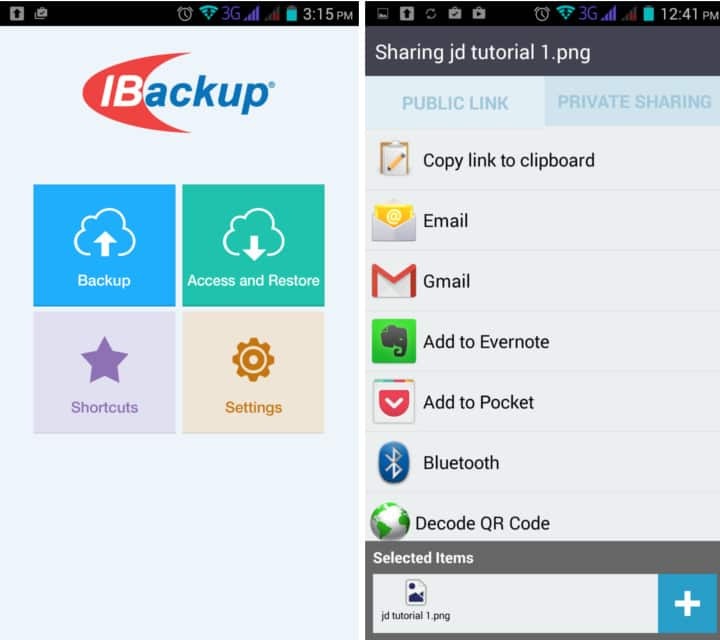 Backup allows you to store contacts, calendars, SMS, call logs, apps, and media on the cloud. An automatic camera upload allows you to back up photos and videos as you take them. Unlike the desktop client, the mobile app lets you preview photos with either thumbnails or in a gallery format. Navigating through files in their original file structure can be a pain, but adding shortcuts makes this process less of a hassle. More specific functions are left out of the mobile app, such as restoring previous versions of files and performing archive cleanups. As IBackup is primarily for security and restoration purposes, it doesn’t support any sort of real-time synchronization. IBackup can be integrated with Microsoft Outlook to back up emails, but other app integrations are sparse despite offering a developer API. Public links to files can be shared via email, Facebook, and Twitter, but bear in mind this will only lead users to a download and preview page and will not natively post media to social networks. IBackup boasts a range of methods to get in touch. Sales and technical support are available both inside and outside the United States by phone, but only between 6 a.m. and 6 p.m. California time. Alternatively, you can submit a ticket or contact IBackup’s 24/7 live support. I tested the live support chat and was encouraged to get a representative within seconds of opening the chat window. Unfortunately, I found his knowledge severely lacking. As mentioned above, I had read in other articles that IBackup supported email dropping, in which a user sends an email with an attachment to IBackup and that attachment is uploaded to his or her storage. The rep had no idea what I was talking about and insisted that I was trying to send a public link. Through Google, I found an FAQ page on IBackup’s explaining how to use email dropping. When I tested it out using the steps in the FAQ, the email just bounced. It seems IBackup might have once supported email dropping, but in any case it doesn’t work now. When I sent the support rep the FAQ link, he just seemed to ignore it and give me more instructions on how to send a public link. This brings me to my next quibble with IBackup. It’s website is scattered and confusing to navigate. I had better luck with Google than the company’s own website when searching for information. Obsolete information on IBackup’s site remains active and indexed by Google, making the hunt for reliable help difficult. Cancelling an uninstalling IBackup is simple and takes less than five minutes. However, even after the uninstaller runs, IBackup leaves at least one system process running that makes it difficult to delete a few residual files. Sorry to say I’ve had a terrible time with this company as well. I decided to give their 2 year in advance option a try. First off, their service is incredibly slow to upload to. I have about 600 Gig of data to backup, and I think it might have taken 2 or 3 months to get it all uploaded with the slow speeds. After I saw how slow the speeds were I decided to stop the backup and test what it would be like to download a backup. Their web interface constantly failed to allow me to download a backup, and I opened a support ticket less than a week after purchase. Numerous back and forth emails with them telling me they fixed it and it not being fixed led me to finally stop replying to their requests. So I eventually asked for a refund in under 30 days but they are now telling me that since I didn’t request a refund in 15 days that they were keeping my payment, even though I had an open ticket with them. If I were you I would not trust this company with your data. iBackup software works fine. The 1 star rating is for their support and billing departments. You will save A TON of money if you just sign up as an affiliate and pay for each of your individual clients with iDrive plans. They will NOT let you downgrade your iBackup account unless you are using less than 75% of the space you want to downgrade to!!!! Horrible. So you have to delete stuff, downgrade, then re-upload. Insane. The pricing for iBackup is WAY more expensive than iDrive. iBackup allows you to create sub-accounts…however you are unable to drill down into those sub accounts via their portal to manage/review the backups for the sub-accounts you have created. So, if you have to log out and log back in as that individual user (sub-account) anyway, why not just set them up with iDrive and save yourself some money. This also makes it easy for the client to pay for the services themselves if you want. Don’t bother with their custom-branded iBackup – we did that and the never upgrade the installation package. So when you upgrade the software, your branding (logo in the task bar) goes away. iDrive and iBackup – same software on the PC side, just a different name. It does allow you to back up SQL databases locally or to the cloud, exchange (brick-level too), system state, etc. We tested the SQL backup and it did work after jumping through a few small hoops. We have used iBackup for about 4 years now – trying to deal with their billing and support people in the last 2 months has been TERRIBLE. Just know they do not have your best interest in mind. They will not tell you the above unless you ask (75% max utilization to downgrade an account), etc. I worked for a month to reduce my data amounts so I could cut my bill in half….and now am stuck paying for another month of service because I was not informed of the 75% max utilization level. I have been trying to restore a server drive from IBackup for two weeks. Their server has gone in to maintenance mode two times in two weeks for three days at a time. I select the files that I want to restore their software selects what it wants and restores that. Chat support is poor at that. There is very little phone support. I do not think this company should get 1 star.